Since, I did projects for coffee individuals yesterday; I decide I need one for teas drinkers, too. Use a 1/4" seam allowance! 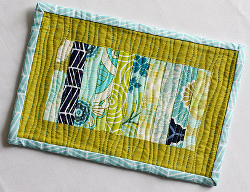 Take your 10 print strips and sew them together to create a little patchwork rectangle! Press your seams. Attach your 8" sashing strips on the long side of your pieced rectangle. Press your seams open. Attach your remaining sashing strips to the short ends of your rectangle. Press your seams open. Make a little quilt sandwich with your backing fabric, batting, and pieced top. Baste! Quilt as desired using coordinating thread. Quilt with wavy lines by using a walking foot, purposely wiggling. Stitch using green thread every 1/2" or so, then went back and stitched with turquoise thread in between my previous quilt lines! 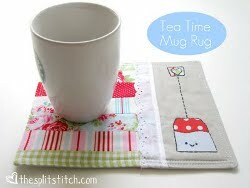 Trim your backing and batting and square up your mug rug. Create your double fold bias tape and bind away by machine stitching it to the front and hand stitching it to the back. Materials: 7 quilting weight cotton prints cut to 6.5” x 2” each for patchwork insert, 1 solid quilting weight cotton (with embellishment if so desired) cut to 4” x 8.5” for side panel, 1 quilting weight cotton print cut to 8.5” x 9.5” for back, 1 piece of fusible fleece cut to 7.5” x 8.5”, Sewing machine, thread, 70/10 & 90/14 universal sewing machine needles, tool for turning corners, scissors or rotary cutter, iron, etc. * A 70/10 universal sewing machine needle is used to assemble the entire mug rug until the last step – the topstitching is completed using a 90/14 universal sewing machine needle. * All seam allowances are ½”. Center and fuse the fleece to the WS of the back piece of fabric. Set aside. Take your 7 cotton prints for the patchwork insert, and determine what order you would like them in. With your first and second fabric pieces for your patchwork insert, and place them RST. Align the raw edges. Sew the 2 pieces together along one of the 6.5” sides. Continue sewing all of the 7 prints together to form one patchwork insert piece as shown below. Using scissors or pinking shears, trim all of the seam allowances down to ¼”, and press all of the seams open. Using a rotary cutter and ruler, trim the sides of your patchwork insert if necessary to straighten them out. Align the raw edges of one side of the patchwork insert with one of the long sides of the side panel piece as shown in the photo below. (Note: Your side panel piece will likely be the same length as the patchwork insert piece, due to a cutting error on my part, the side panel piece was a bit shorter, so simply centered it on the patchwork). Pin the 2 pieces together, and sew. Optional: Attach a piece of eyelet over the seam. Use tape (rather than pins to temporarily affix the eyelet, then simply sewed over the stitching created by the manufacturer to permanently attach the eyelet. Your front of the mug rug is now complete. Place your completed front piece on a flat surface with the RS facing up. Place your backing piece (from step #1) on top of the front piece RST. Align raw edges and pin together. Along one side ( “side panel” side), use a water soluble marker, or any other marking tool to mark a 3” opening to use for turning. Trim all of the seam allowances down to ¼” EXCEPT for the side with the opening (To close an opening with ½” of fabric than ¼” of fabric available to topstitch over). Turn the mug rug right side out and press. Be sure to press the fabric left from the opening inward. (Switch to your 90/14 needle now!) Using the side of your presser foot as a guide, top stitch around the entire mug rug. This will close your opening left for turning. Then, when you are finished, go back and add another line of topstitching around 1/8” beyond your first line of topstitching. Press the entire piece.